As usual, the first half of the meeting was spent introducing ourselves to each other and discussing everyone’s various interests and virtual world projects. 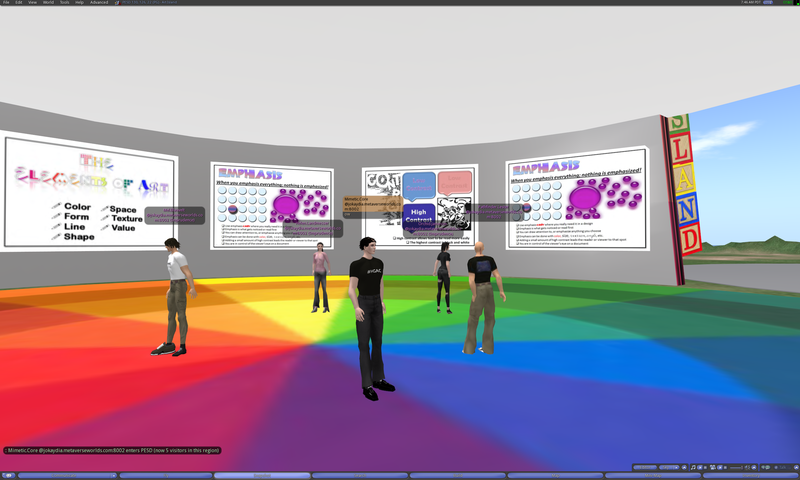 The second half of the meeting featured a live tour of the Hypergrid. Read on for a full transcript, pics, and to see how teens are working collaboratively on ReactionGrid to learn about serious historical events as well as just have fun. We begin on the region Pathlandia, located on jokaydiaGRID. Pathfinder Lester: it’s neat, isn’t it? Pathfinder Lester: we’ll officially start the meeting in a few min. Pathfinder Lester: everyone have a good halloween? eat all the candy already? 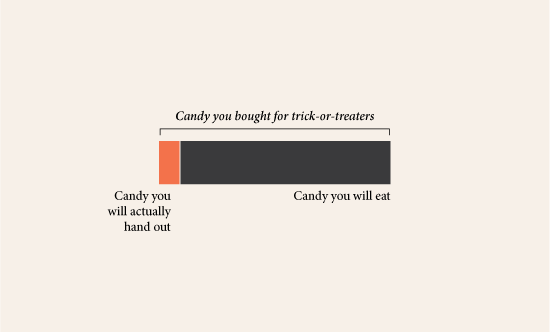 Pathfinder Lester: i found a really funny graph about halloween candy. lemme see if I can put it up here. Helen Landmesser: Have a candy bar in front of me right now. Pathfinder Lester: yeah, all the stuff like “bit-o-honey” gets handed out first. man, I can’t stand those bit-o-honey things. Jokay Wollongong: pfft honey when you can have real, teeth rotting sugar! Pathfinder Lester: they don’t even taste like honey! what the heck is that all about? Pathfinder Lester: has to be. Pathfinder Lester: ok, i’m going to kick things off. thank you all for coming today…. 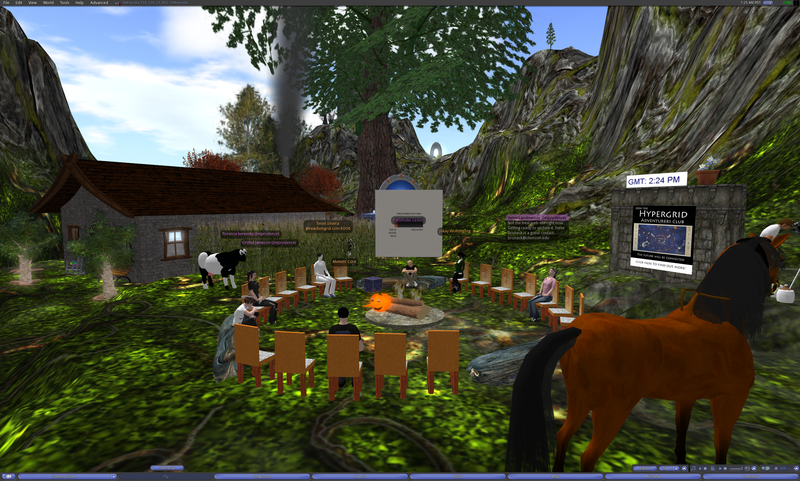 Pathfinder Lester: this is the 5th meeting of the Hypergrid Adventurers Club! Pathfinder Lester: for those of you who attended and read my blog summary of the 2 meetings on Sunday, it was pretty amazing…. Pathfinder Lester: we went to FrancoGrid and attended a live rock show there. met lots of folks on FrancoGrid, too. Jokay Wollongong: some great images too! Pathfinder Lester: and I’ll tweet about the upcoming shows on #hgac as I learn more, so you all can have a heads-up about it. Pathfinder Lester: and one more thing about FrancoGrid…. Pathfinder Lester: I’m going to tweet on #hgac to remind folks about the Opera. I think it will be really amazing. Pathfinder Lester: and speaking of communication, I’m working on setting up a mailing list for the HGAC. Pathfinder Lester: that will allow us to talk to each other easily between meetings, and to help folks network with each other. Pathfinder Lester: I’ll blog and tweet about the mailing list in the next week, so stay tuned about that. Pathfinder Lester: and as usual, I will be posting a full transcript and report of this meeting on my blog. so don’t worry if you just came in late. everything will be recorded. Pathfinder Lester: which also means, if you do NOT wish for your chat to be included in the log I post, please just say so in open chat and I’ll redact your comments. Pathfinder Lester: so as usual, the first 30 min of this meeting will be open discussion and introductions. 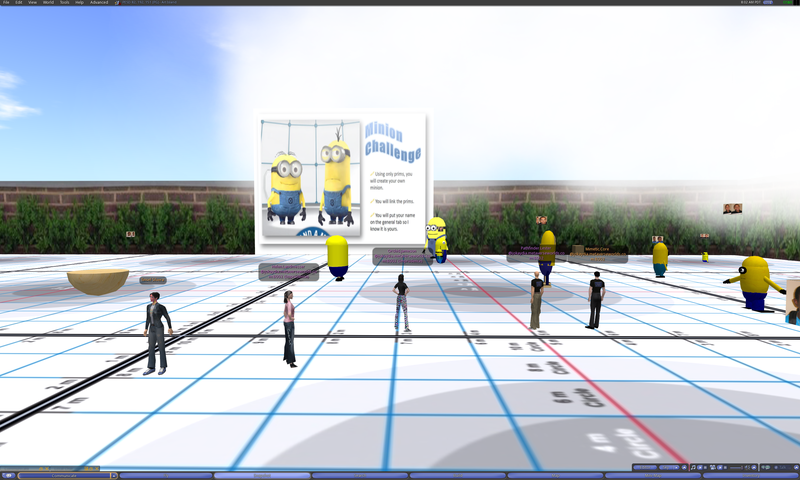 2nd 30 min will be a live tour of a place on the hypergrid…. Pathfinder Lester: Orchid, go ahead. ask away. Pathfinder Lester: the answer is, it doesn’t matter. each identity is unique, even if a “visiting” av has the same name as someone already registered on that particular grid. Tinsel.Silvera: I am guessing that our inventories are tied to our uuid’s on each grid? Jokay Wollongong: It shouldnt be a problem orchid.. when you hypergrid.. your inventory and your identity is still be managed by your home grid (ie the grid you are logged in to)..
Pathfinder Lester: i have a pic hanging up in my lodge here on Pathlandia of me meeting me. Here’s the picture hanging on the wall of my lodge. In this photo, I am logged in using two accounts, Pathfinder Lester (home grid jokaydiaGRID) and Pathfinder Lester (home grid ReactionGrid). Jokay Wollongong: hehe.. me too pathfinder.. thinks we should have an exhibition of them! Pathfinder Lester: and when you visit other grids, your name over your head will indicate where your account “lives”…after the “@” sign. Pathfinder Lester: Tinsel, what’s your question? Jokay Wollongong: Ah yes.. the maps sometimes take a little while to update..
Pathfinder Lester: SarVana, no worries. take care, and nice to meet you! Jokay Wollongong: Hrm.. we do have a mapped link between RG and jokaydiaGRID..
Jokay Wollongong: to make it easier for people to pop between our two spaces..
Tinsel.Silvera: There seemed to be some residual that remained with me. Jokay Wollongong: Sooo.. im guessing.. maybe you clicked the mapped sim..
Helen Landmesser: I could not figure out how to get from RG to here earlier. Jokay Wollongong: If you want to try out the mapped link..
Jokay Wollongong: go to Scooter Sim..
Orchid Jameson: whispers… this is my first meeting… is there a notecard I can grab to catch up.. ? Helen Landmesser: Orchid, my first mtg too. We will make this jump in a new way! We’ll be using one of the instant Hypergates on Pathlandia. It’s the stone archway next to the big tree across the water to the West from our meeting circle. Just walk up to the archway and walk through it. You will automatically make a Hypergrid jump to jokaydia.metaverseworlds.com:9010. PESD island is the home of Norma Underwood (RL: Noreen Strehlow). For 4 years, Norma was the technology integration specialist for the Phoenix Elementary School District #1 in Arizona. Today she is an art teacher in the district, and she works with teens on PESD island on collaborative art and historic recreation projects. Today we’ll be exploring PESD island and projects such as a recreation of the Lincoln Memorial, a Holocaust Memorial, and many student-created art projects. Jokay Wollongong: I’ll draw a picture and post it on the blog and we can share with Hypergridders..
Pathfinder Lester: also, please everyone type in open chat a little introduction of yourself and your projects/interests. that helps folks get to know each other and network. Mimetic Core: there are still some oddities with the HG setup. i will have mixed results on my own grid. Jokay Wollongong: The map updating is an annoying one for sure..
Helen Landmesser: Working at SimHub in Greenville, SC. 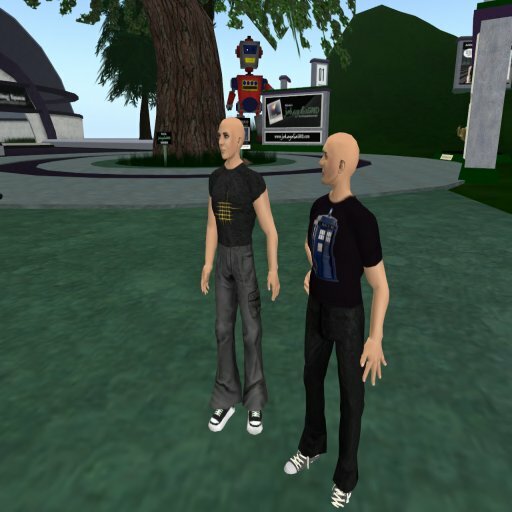 New tech project of University Center, encouraging faculty and students to use virtual worlds for teaching and learning. Will also be helping develop OpenSim grid for Clemson and virtual world consortium. Pathfinder Lester: Helen, what’s the virtual world consortium? Pathfinder Lester: is there a website where we could learn more about it? Pathfinder Lester: collaborative efforts like that between schools are a great idea. share resources, experiences, and knowledge. Jokay Wollongong: great to see! Pathfinder Lester: League of Worlds is very neat. I got to meet Owen Kelly for lunch when I visited Finland a few weeks ago. Pathfinder Lester: Helen, ty for the link. Pathfinder Lester: so, let’s see.. anyone have any general questions, please just shout ’em out. Pathfinder Lester: will be great to watch that org grow. Pathfinder Lester: Helen, so do you do many presentations to faculty to introduce them to the idea of virtual worlds for learning? Helen Landmesser: Yes and we offered mini grants this summer to get several started. Using SL and Teleplace currently. Pathfinder Lester: oh wow, you offer grants? that’s great! Orchid Jameson: may I ask the source of your funding for grants? Pathfinder Lester: Orchid, yes, that’s no easy task to accomplish! Pathfinder Lester: What do you mean exactly by them holding the keys to the land? Pathfinder Lester: what brings you here? Helen Landmesser: Director of the University Center, Fred Baus, sees the value of exploring new avenues. The Univ. Center has seven universities, Clemson, USC Upstate, Furman, Lander, SC State, MUSC. Members pay fee per student using space, part of SimHub start up funding. If there is not something in it for them, faculty will not try new things. Metta Lane: Yes, it was! Thank you for being there! Helen Landmesser: Welcome, Metta. Planning to visit Turkey next summer. Pathfinder Lester: my pleasure. it was fun to demo Opensim-on-a-USB-key too. i had never done that before. Pathfinder Lester: i had never been to Turku before. beautiful town. Helen Landmesser: Please also check out simhub.org for info on what we are doing. Pathfinder Lester: Orchid, that’s one way you can get around the problem of admins holding the keys to something. carry your own world around! Jokay Wollongong: Roger Stack has made a great recipe for setting it up..
Pathfinder Lester: Orchid, i blogged about how to set up Opensim on a USB key. following Roger’s recipie. it’s really easy. Pathfinder Lester: the point of my blog post was to show how easy it is to set it up by following Roger’s recipie. anyone can do it, really. Jokay Wollongong: talk to the lovely Chimera Cosmos..
Pathfinder Lester: Tinsel, I found a blog post about how to set things up on a Mac. i’ll see if I can find it. Orchid Jameson: that would be great Pathfinder..
Tinsel.Silvera: which grid is CC’s homeworld Jokay? Jokay Wollongong: and in RG too im pretty sure..
Helen Landmesser: Florenze, you’ve been doing this a while. Pathfinder Lester: i’ll dig for it later. will add the link when I post the transcript of this meeting later. Pathfinder Lester: today, we’re just going to make 1 jump. Orchid Jameson: may i set home here? Pathfinder Lester: PESD island is the home of Norma Underwood (RL: Noreen Strehlow). For 4 years, Norma was the technology integration specialist for the Phoenix Elementary School District #1 in Arizona. Today she is an art teacher in the district, and she works with teens on PESD island on collaborative art and historic recreation projects. Pathfinder Lester: and to get there, we will just take one of the instant Hypergates here on Pathlandia. Pathfinder Lester: we’ll wait for Orchid to get back, then we can head on over. Helen Landmesser: lead the way..
Pathfinder Lester: please follow me. Pathfinder Lester: just be sure you haven’t eaten in the past hour. The group walks through an instant Hypergate on the region Pathlandia to make a Hypergrid jump from jokaydiaGRID to ReactionGrid. And here we are arriving on the region jokaydia on ReactionGrid. Pathfinder.Lester: i really like the instant Hypergates. makes it easy and immersive. Orchid.Jameson: is this similar to what folks on sl call Star Gates around sl? Helen.Landmesser: So is there a gate here that goes back to Joykadia? The group makes a local teleport to the region PESD. Helen.Landmesser: Awesome, we’re on the color wheel. Pathfinder.Lester: Norma Underwood runs it, and she works with teens here. Pathfinder.Lester: let’s go outside. there are a couple specific places id like to point out. Pathfinder.Lester: so if you have anything you’d like to add, please feel free to leave it now or sometime later when you visit again. Orchid.Jameson: appropriate to leave on Jewish memorial..
Pathfinder.Lester: the kids really love that aspect of virtual worlds. working as groups together on things inworld. Orchid.Jameson: Does anyone have a pebble in inventory they could pass me? Orchid.Jameson: lol its ok Pathfinder… I’ll find my way back..
Orchid.Jameson: ok.. slow learner day… as we jump around how can we tell what grid we’re on? Pathfinder.Lester: i learned something new!!!! Helen.Landmesser: So something is up above us? Pathfinder.Lester: in Imprudence, Help>About alaso seems to show where your “home” grid is. where your account and inventory lives. Tinsel Silvera: time for foosball? Pathfinder.Lester: i think this is a great example of how to make a collaborative lesson that kids will have fun doing. Pathfinder.Lester: Helen, i know! it’s always like that. Helen.Landmesser: Thanks for tour. Nice to meet everyone. Pathfinder.Lester: yes, always great to see new folks joining us! Pathfinder.Lester: i have some time beforeI need to leave, so I’m happy to hang out and chat for a few min more. Orchid.Jameson: Pathfinder is this time one of the regular times set for the Explorers group? Orchid.Jameson: Are there any inworld Explorer groups…. or is that what your offline email group will be? Pathfinder.Lester: but since that has gone away, she is here now. Pathfinder.Lester: so that’s the tour. woot! any questions? Orchid.Jameson: Thanks so much for doing this Pathfinder! Mel.Blauvelt: great fun as usual! Pathfinder.Lester: and if anyone finds interesting places on the hypergrid, please let me know. we can go visit them as a group! Pathfinder.Lester: ok, i’ve got thead out now. thank you all for coming! Tinsel Silvera: have a great day everyone! This entry was posted in Announcements, Avatars, Education, Hypergrid Adventurers Club, OpenSim, Virtual Worlds and tagged art, avatars, education, history, HyperGate, HyperGrid, Hypergrid Adventurers Club, jokaydiagrid, kids, metaverse, OpenSim, ReactionGrid, virtual worlds by John "Pathfinder" Lester. Bookmark the permalink. It was nice seeing you today! Until next time! feel free to visit my Wizzy and Xeno sims on Reaction Grid. in fact, i volunteer to give a tour.